Glory be! I never expected to find a source to rent boats from any where in the world. You can search by type, size, (from paddle boards on up), location, and price. Get My Boat bills themselves as the AB&B of boats. I’m thinking they are right. The following, is what they have to say about Oregon and I’ve included the hotlink to the boats available in Oregon at the bottom of the page (1 – 18 of 213 listings. Once you are on the site, you can search anywhere in the world. It’s good to “Know Before You Go” – smile. When it comes to boating in the Pacific Northwest, many people first think of Washington or southeast Alaska, but the state of Oregon also has a number of excellent boating opportunities that are well worth the trip. Many of the best lakes in Oregon are at altitudes of 5,000 feet and higher, and a few of them are even formed as extinct volcanoes. If you are traveling from out of the region, remember that the Pacific Northwest is very temperate. The state’s climate tends to be a little sunnier and warmer in the summer than its neighbors to the north. There is beauty and ample opportunity for all kinds of boating rentals in Oregon. Here is a look at some of the best boating lakes and rivers to discover in Oregon. One of Oregon’s most scenic locations is called Crater Lake— known as one of the most beautiful locations on the planet. Crater Lake is the site of an extinct volcano, and offers views of high mountain peaks reflected in perfect glassy waters. The new baby volcano cone serves as an island in the middle of the water and is great to explore. The lake is open for fishing as well, with proper licensing. If you do not bring a boat with you, there are rentals in Crater Lake like kayaks, canoes, boat tours, yacht rentals, and fishing charters are available in the area. If you are a big fan of the Grand Canyon in Arizona, then Hells Canyon Dam in Oxbow will be worth the visit when you come to Oregon. You will find a marina, jet boat tours, and fishing boat rentals here. The water here is not placid, and is home to a number of white waters and other excursions. 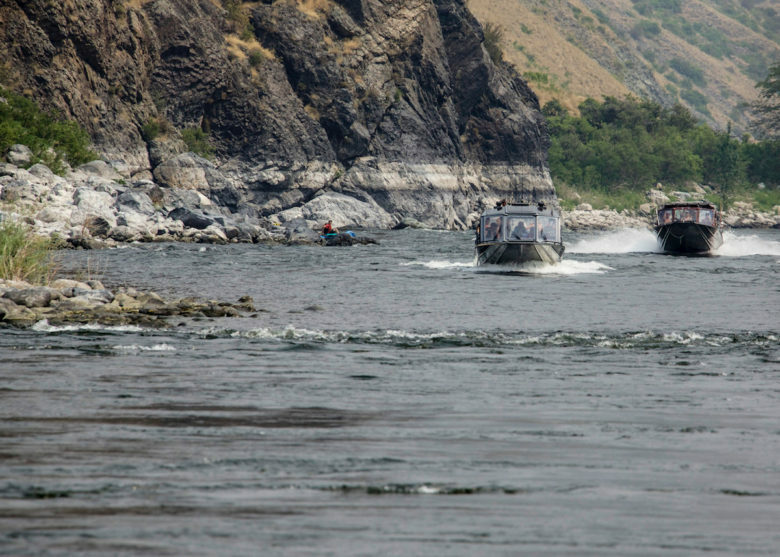 If you have your heart set on boating, the shores of Hells Canyon are full of experienced captains ready to share the beauty of this extreme canyon with you. Detroit Lake is nine-mile man-made lake in Oregon only about an hour east of Salem. It is also a camping lake and has just over 200 spots for both tent camping and RV hookups. The water is warm here, which makes it a better lake for play than for fishing (though there are places to do that here, too), and it is probably the most popular play lake in the state. You will find it easy to rent boats and watercrafts in the area since it is an excellent place to waterski, tube, jet ski, kayak, canoe, stand up paddleboard, and much more. The limit to the number of campsites usually keeps boat traffic on the lake at a reasonable level, though super hot weeks can fill up fast. Because of this, camping reservations here for the warm months fill up quickly, and it is good to try and book many months in advance. The campgrounds also have amenities like amphitheaters, nature hikes and tours, protected swim areas, and on-site firewood sales. There is an opportunity to check out the Detroit Dam that formed the lake as well. Mount Hood’s National Lakes are the most visited sites in Oregon during the summer months. The lakes here are numerous and small, and known for camping, fishing, hiking, kayaking, canoeing, swimming, and more. They include Lake Trillium, Timothy Lake, Frog Lake, and Clear Lake. Mount Hood is closer the larger city of Portland, so these lakes tend to get a bit more traffic.